There’s so many places in Indonesia that will serves us with thousand of richness in the way of culture and natural resources. What’s so relieving is the fact that they can use the natural resources with so many kind of ways to make the most delicious dish ever. Like in this area for example, North Sumatra. Beside having so many wonderful natural attractions, North Sumatra also has so many varieties of foods. 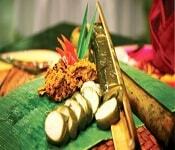 The first one we have on our list of traditional foods in North Sumatra is Anyang Pakis. Some of you may not know about this food yet, here’s some informations for you. 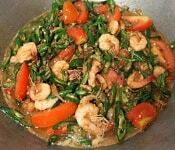 This Anyang Pakis looks like the Urap in East Java, either by the toppings or vegetables. Usually in the Ramadhan month, so many people sell this Anyang Pakis as a menu for breakfasting. 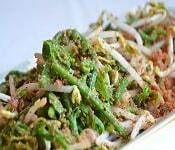 The fresh vegetables combine with delicious coconut sprinkles make this food really suitable during Ramadhan. The next one is Lemang or you can call it as Nasi Lemang. The rice of Lemang is actually the food that really famous in Indonesia and Malaysia, especially in the border in between, like North Sumatra for example. 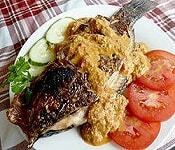 You can see the cooking session of it by the restaurants at North Sumatra, and also the other places around the Sumatra island. Usually they use the bamboo to cook it, which is the most important stuff. In the third place there’s Bihun Bebek. 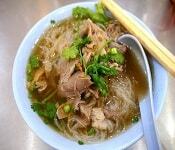 In the English version, its name changes to Duck Vermicelli. This vermicelli is quite expensive, this is actually the most expensive food that using duck as base ingredient. But, expensive price comes with high quality. In one bowl of Bihun Bebek, you can find so any duck meats, and then the vermicelli itself and also the additional sauce. The combination is really good to be honest. Next, there’s Soto Udang. 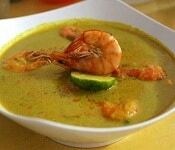 Soto Udang or the Shrimp Soto, is another kind of soto that originated in North Sumatra. Not like the other sotos in Indonesia that uses the meat of chicken, in this Soto Shrimp, they mainly use the meat of the shrimps. The taste is very good, especially when the refreshing soto combined with the fresh cooked shrimp, creating the beautiful combination in between. 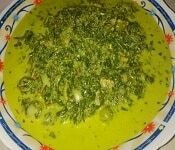 The next traditional food in North Sumatra is Sayur Tauco. Sayur is the Indonesian language for vegetables. So as you can see, there’s so many vegetables in the Sayur Tauco. Those vegetables added with this tasteful sauce, making it more delicious. It’s perfect for the lunch and dinner. Better eat it with some rice, and kerupuk (snack). You don’t need the additional side dish to eat it, because inside the Sayur tauce there’s already many stuff putted in, like shrimp and tofu. After Tauco, in this sixth place there’s Kari. Not like the usual Indonesian Kari that has the white and yellowish colour, the sauce in this Kari has the thick yellow colour, almost orange-ish. That’s the speciality, the sauce that contains so many kind of spices. You can eat it with some noodles, or maybe with rice. But usually they serve the Kari with the vermicelli because it’s way better than those two. But you can pick whatever you like to accompany you eating this Kari. Not like the usual porridge in Indonesia that has the tasteful and salty flavor, this spicy porridge will bring you some challenges. The flavor is so spicy that you’ll need some water afterwards. They put much spices especially the chilli into this porridge. The Spicy Porridge is usually served during Ramadhan Month in cities around North Sumatra. The spicy flavour is really an eye-opening after the long day fasting. The next in is Arsik, that really famous in the area of Tapanuli, North Sumatra. It’s basically just bunch of vegetables, some fishes, and don’t forget the yellow spices soup. Combine them all into one tasty Arsik that has the delicious Indonesian taste. But after that, usually they add some chillis on top as the toppings. 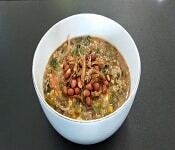 The chilli are also useful to maintain the spicy flavor of the soup. It’s really good either for lunch and eating in evening. Don’t eat this spicy stuff during breakfast, it won’t work. Like the Japanese version of sashimi or sushi, there’s also some uncooked stuff in the area of North Sumatra. The name is Naniura, the beautiful side dish of Tapanuli. This food is actually one of the King dishes in the old times. But because of the rolling times that keep going on, usual people can eat it too up until this very day. Naniura is the fish that combined with sour sauce. Remember, the fish used in this dish is the raw goldfish that cut in a half, and then added with the sour sauce. The fish will be cooked “chemically”. 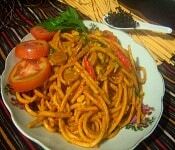 The next food dish of North Sumatra is Natinombur. Not like the food above that will use some sour sauce as the additional ingredient, in this Natinombur, people usually use the sauce that came from the combination of many spices, including nut. So, this Natinombur is rich of flavor, it has the sweet and also the spicy that came from the chillis. It’s very good up until now, many people still like it even though it’s served since a long time ago. You must try this too! 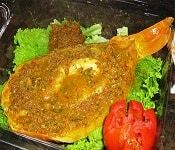 The next traditional food in North Sumatra is the Manuk Napinadar. Maybe you can see it in the ceremonies in Indonesia like the wedding or the other stuff. But if you want to try it alone, you can come by the batak restaurant in your place. This Manuk Napinadar use the chicken meat. 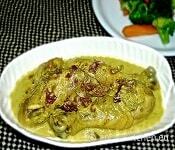 Some of you may think that this Manuk Napinadar is none other than the usual chicken dish out there. But pay attention, there’s something in the sauce that make this Manuk Napinadar. 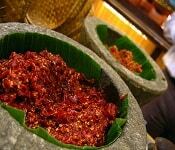 It’s the Andaliman, the North Sumatra’s ultimate spice that only exists in the area of Sumatra. 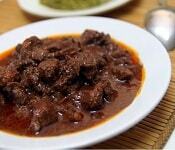 This food is also has the same thing like the food above, the usage of blood in the sauce. Yes, both of these foods sometimes use the blood inside their sauce. 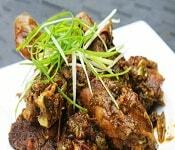 But here’s the thing, this Saksang is only use the pork, not the chicken meat. But in this time, the use of blood is still being a controversy, so they only add the original sauce with spices, but without the blood. Beside the meat of pig, they usually do other variants by using the meat of dog and buffalo. 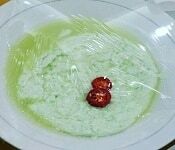 This is actually not a main dish, but this is actually a bit better to included as a side dish to eat together with the rice and some meals. Silalat uses the base ingredients, the cassava leaves. Even though it’s so bitter, they usually make the leaf less sour before combine it with other stuff. The name of this side dish is not only Silalat. You can find so many of its names, like Gule Bulung Badung and Parcak, based on where it’s made. But even though it’s only a side dish, the taste of it is pretty good. 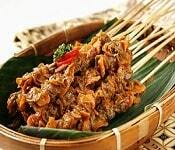 If you only consume the chicken or goat satay of Indonesia, then your journey of satay ain’t complete without trying the famous and delicious shell satay. No, you don’t eat the shell as a whole, you only eat its meat. The mat putted into a wooden stick to become a satay. You can usually see them in your nearest area, the sellers usually call themself as the 02 Satay Sellers. Also, the variants of this shell satay are also so many. In one time you can see it served without sauce, just plain shell meat. Then in other time you can see it combined with additional sauce. Pick what you prefer. Again, this is not the side dish, but this sambal or sauce is very iconic. You can say that this is one of so many icons that resemble the name of North Sumatra. 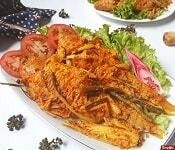 This sauce is originated in the sea shore of Tapanuli, where you can find so many fish right there. They do a really great job in combining the spices with the fish. The tase is so rich, and this sauce is really suitable for any of your main dish. It’s outstanding! The next one is really interesting, the natural cheese-like food from North Sumatra, the Dali Ni Horbo. If the cheese usually came from the cows, this Dali Ni Horbo is came from the buffalo. Not only the ordinary buffalo, but also the buffalo who finished giving birth to its kids. Well, if the cheese was made with addition of chemical, this Dali Ni Horbo is made 100% naturally. The people of North Sumatra usually use the Pineapple water to maintain the condition of the milk. And then in the last place, we have the Gomak Noodle with us. Yep, it looks almost like the spaghetti from Italy. The way it’s named Gomak is actually came from the way to make it, by doing Gomak (squeezing) in the old days. The price of it is really cheap for this wonderful noodle of North Sumatra. You can also pick the wet or the dry version of Gomak noodle. Both of them are really good to eat, it’s really recommended for you who want to travel in here, North Sumatra. You should bring some for the people in your home, or maybe your friends. The hanging out time will be much better. Beside what I explained above, here i give you information from foreign that already taste traditional food from North Sumatra. That’s the 17 traditional foods that available in the area of North Sumatra. Those are the best one in Sumatra, you can pick anything you want that really suits you. Which one is your favorite? Let us know by writing your own comments below. Hope you can enjoy your wonderful food journey in North Sumatra, enjoy!